I recently found a post on a Hebrew blog that connected a few words that I had thought of writing about separately. The blogger Ilan here writes about heichal היכל, adrichal אדריכל and tarnegol תרנגול. What do these words have in common? They all derive from the ancient language Sumerian and share a common root. Let's take a look at each of the words. Probably a loan word from Akkadian ekallu ( = palace), whence also Phoenician הכל, Biblical Aramaic and Aramaic היכלא, Syriac היכלא, Mandaic היכלא, Ugaritic hkl ( = palace, temple). Arabic haykal ( = church) is probably an Aramaic loan word. Akkadian ekallu is probably a loan word from Sumerian e-gal ( = great house). Adrichal in Modern Hebrew means "architect", and first appears in the Talmudic literature. 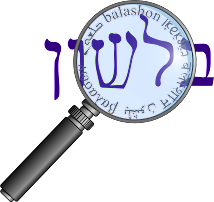 However, it also appears there as ardichal ארדיכל, and most sources say that is the original form. The etymology of this form, according to Even-Shoshan is from the Akkadian erad-ekaly. This means "worker of the heichal" - and as we just noted, heichal is originally Sumerian. Ilan points out that originally the adrichal was the builder, not the architect. Erad here is related to the Akkadian word aradu - "to serve" and ardu - "slave". This appears to be cognate with the Hebrew root ירד - "to descend", and relates to the lower, subjugated status of the slave. And lastly we have tarnegol - "rooster". Klein writes that the word is "borrowed from Akkadian tar lugallu" which is in turn borrowed from "Sumerian tar lugal (=bird of the king)." Lugal meant king in Sumerian, and it was made up of two parts - lu (man) and gal (great, as we saw in heichal).